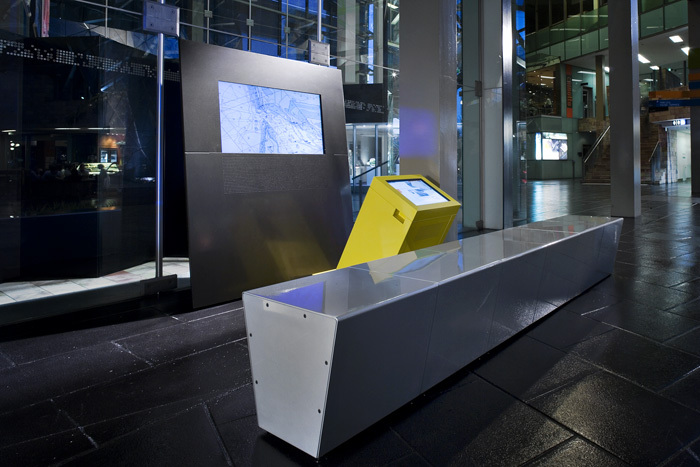 Project brief: Develop a modular physical environment to access digital content on line from Victoria's leading cultural institutions and create a physical experience that acts as an appropriate gateway to Victoria's cultural capital. The individual nodes or sites must also act as banners for this digital network initiative. The key collaborators in the Victorian Cultural Network are the Australian Centre for the Moving Image, Federation Square Management, Museum Victoria, the National Gallery of Victoria, State Library of Victoria and the Victorian Arts Centre Trust, the Koorie Heritage Trust and a number of regional institutions. The purpose of the project is to contextualise Victoria's cultural collections through stories and themes of state significance, making them available to the public as an online integrated resource, making that access easier and allowing for increased awareness of cultural programming. This project presented a unique design opportunity to create a channel or portal into, not only individual Victorian cultural institutions, but also to a connected cultural landscape. It represented the possibility for new ways of accessing existing cultural collections and institutions and for linking them. We wanted to focus on presenting a design that captured some of the emerging possibilities, technically, spatially and strategically. Investment in new communications technology occurs against a background of ongoing cultural change on the part of the public and their use of communications technology. Their response to and expectations of contemporary technology are not static. What is impossible or unusable one year becomes desirable the next and ordinary and expected the year after. The design had to allow for possible technology changes without undue disruption or reconfiguring.The project to design the public access nodes began with research, surveying emerging technologies and public information system scenarios. Our intention was to address the pertinence of the broader underlying trends in information access and identify where benefits from a public access site could be made. The evolution and patronage of the internet, video games, chat rooms, blog sites, mobile phones, lap tops and ultra mobile personal computers, iPods, Mp3 players, cable television, vidcasting and podcasting has generated new patterns of use and expectation that previously did not exist. These changes are just the latest iterations in an ongoing evolution of modes of behaviour and interaction that are characteristic of a society that has gradually institutionalised innovation in communications technologies. Technologies like the internet, the Nintendo Wii and the iPod are tending to invite their users to proactively engage in customising and personalising their purchases unlike older pre-packaged communication products like television and books where the product is complete at the time of purchase. This sets up an expectation of greater user freedom and control. We needed to communicate a similar sense of user control in order to attract interest. In the mind set of the general public architecture is the passive back ground to active technology and also the evermore pro-active user. Public spaces are understood as impassive and solid. Like the background cells in traditional animation, architectural environments never change while everything else glides past them as life unfolds. This is of course not the case with exhibition environments where walls can be moved and the spaces undergo significant change and are configured to create widely varying and rich experiences. These changes however appear to the general public as predetermined remotely and within the confines of a curatorially authorised domain. We wanted to give a sense of informality and potential change to the viewing nodes, that they might unfold or reconfigure. These access nodes are ambassadors of or taxis to the institutions and their collections. At the boundaries of architecture and within installation-art there has been emerging a hybrid discipline that seeks to exploit the potential of the emerging use of ubiquitous computing in environments and the personal control users can now exert through electronic devices like mobile phones. In the nineteen sixties architects like Cedric Price and Archigram saw the potential for new technologies and materials to make buildings very flexible, with systems that responded to user demands, often changing the very shape of the building. In this project the experience common in a gallery space is being extended, through the use of electronics and media out to the broader field of spatial experience more generally. Artists too have explored this territory like Laszlo Moholy-Nagy, Rebecca Horn, E.A.T. [Experiments in Art and Technology], Anthony McCall and Natalie Jeremijenko. They have created dynamic or mobile installations that respond to or invite interference or input from viewers or participants. Projects like the E.A.T. Pavilion project at the 1968 Osaka Expo pushed this idea to an architectural conclusion putting the user at the centre of a dynamic spatial experience. We were keen to reference this work. We looked at creating a sense of a comfortable private space within larger public spaces which users could momentarily call their own while maintaining a high degree of porosity both for security and for arousing interest in the activity from the passing public. 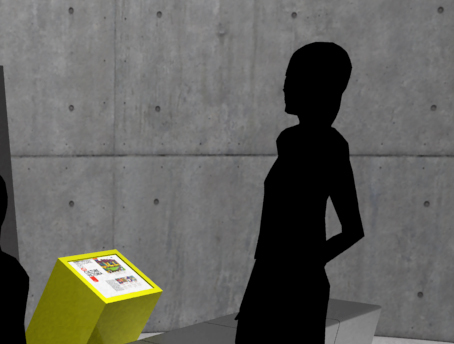 Our metaphor came from the picnic in the park, a temporary private space open to view yet comfortable.We wanted to avoid the automatic association of an overbearing commercial pitch that a stand alone kiosk generates. To us the seating elements needed to be as important as the content elements. 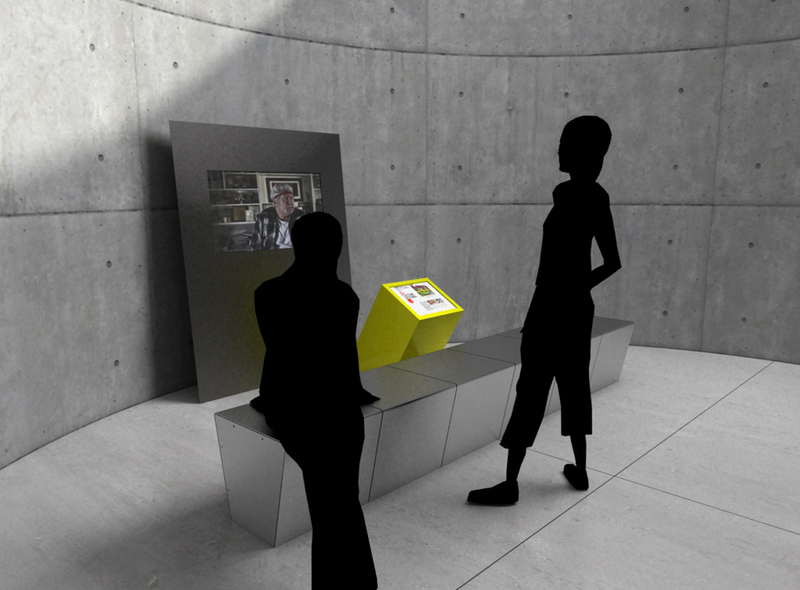 We wanted the outcome to resemble a more interactive information space developed as a more complete experience. We also wanted to recognise the fluid sense of movement that is possible between the real environment and virtual networks. We felt that as a networked, public project these public nodes should leverage the very strong cultural presence and value of the institutions and should attempt to capture that potential in a spatial way. There is the potential to create a space that allows for a sense of adventure rather than just being a transactional space. This might be an experience that is more evocative of discovery or even playing a game. The nodes are mobile and can be upgraded with additional modules as required or reconfigured to adjust their specific site conditions. We began with ergonomic studies and exploring different scenarios of usage. From this we developed a set of modular folded sheet steel components, all with attitude, robust yet easily demountable for servicing and relocation and storage. Each of the principal sites can have a customised version with different materials, colours and seating planning but they all conform to the same basic language so that the expression of a diverse but connected network is created. The nodes are formed from a modular system consisting of 2 simple core screen structures, a larger view screen for content display and the small control screen for navigation. This footprint is kept small. A number of seating modules are then added to complete the site. The seating options range from a perch or leaning bar to a seating bench at 450mm high with an optional backrest. Additional seating can be easily retofitted as required. Optional upholstery elements can be detailed to conform to the user expectations and contextual environments of each institution and each location. A number of partition screens can be attached to the core elements as required for separation and safety. Partition screens can be added to adjust privacy or removed to create easier flow. All of the modules are easily moved. They can be secured as required with shot bags, a theatre set technology now commonly found in cafe fit outs, but when unplugged can be moved by one or two staff members on a trolley to another location or to storage. The design of all of the modular elements allows them to be retrofitted for an easy upgrade to the network experience and for performance as required. A node can be reconfigured by staff as required in response to demand or changing conditions.